You guys. 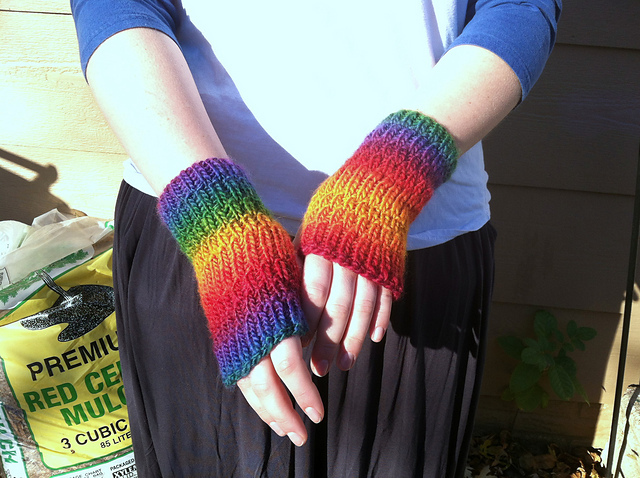 Look at how delightful that yarn looks. This stuff is so soft, I can't even describe it. 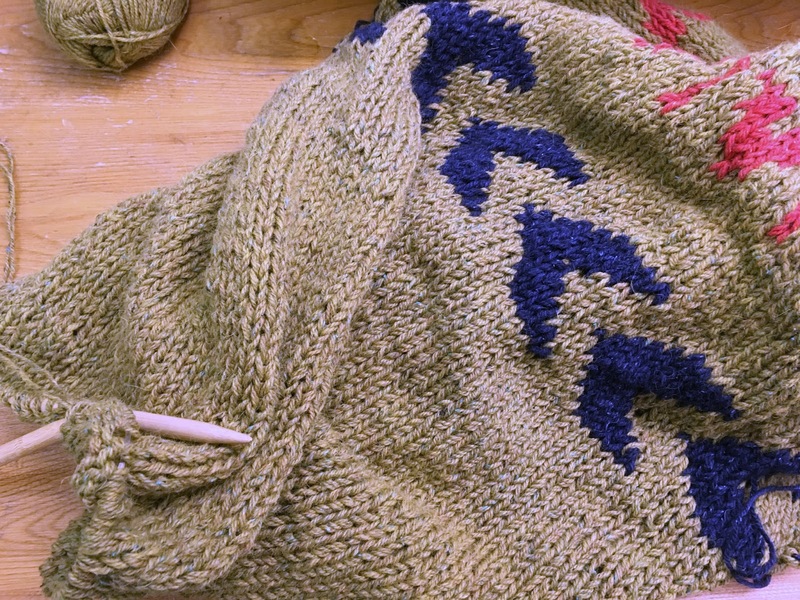 I hadn't worked with Kenzie before deciding to use it for my Filled With Secrets sweater (this is a bad course of action kids, don't follow my example-you should always get to know a yarn before making a garment-sized commitment) but I am so glad that I went with it. I'm definitely doing a before and after post on how this yarn blocks-as amazing and cushy as it is now, it blooms so freaking magnificently. 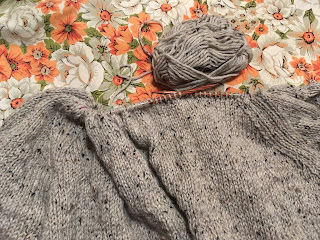 Clearly I did not get the yoke done before Thanksgiving, but I've only got a few more rounds before I divide the sleeves, and then the rest of the body should shoot along just fine. 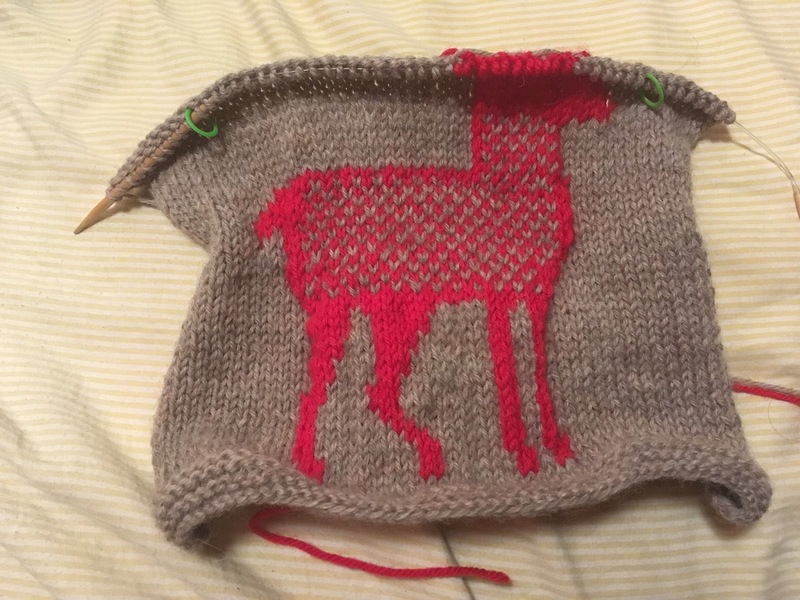 It's really not a slow knit at all, I'm mostly distracted by trying to keep myself focused on gift knitting in the evenings. As much as I'd like to have this done NOWNOWNOW, the KAL goes until January 9, so I have plenty of time, and I definitely have to get my gift knitting (and my Xmas Sweater!) done first. 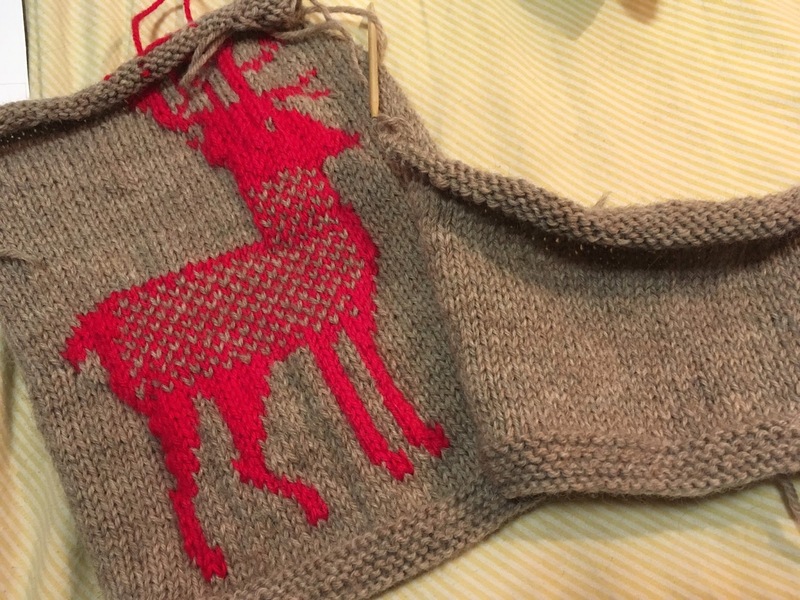 Since I had a four day weekend for Thanksgiving, I planned to do a lot of xmas knitting. 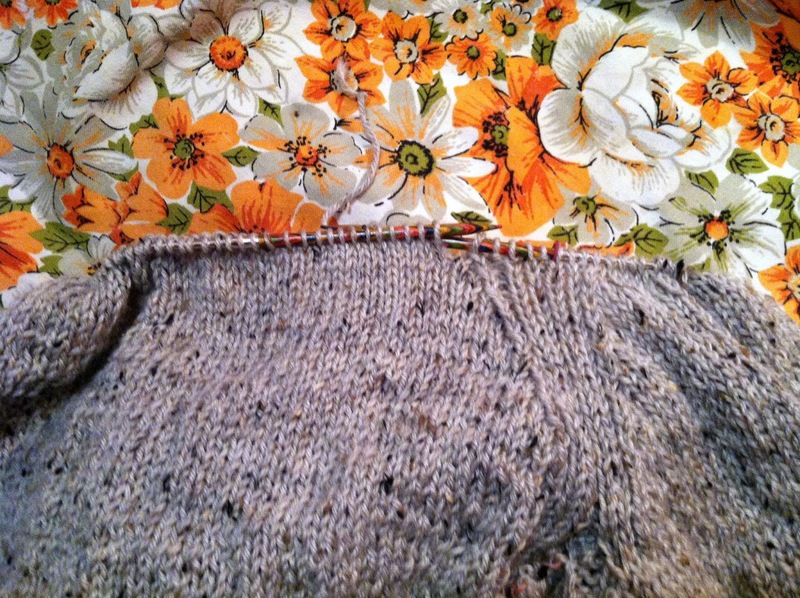 But I'm not fantastic at holding myself accountable, and I only got most of a sweater front done. But look at how cute it is! 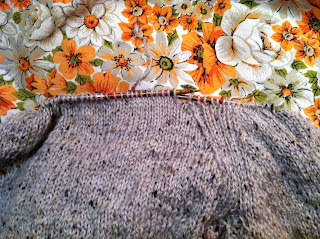 I'm hoping another solid evening of knitting on this finishes the front, and then the back and sleeves should fly along. We ended up actually going out and doing quite a bit over the weekend. Friday Anemone came down from the city and we went shopping, Saturday we set up our tree and I met up with a couple of ladies from my choir to work on a special music trio, and Sunday I ended up hanging out at a friend's house all day. So for all that running around I picked up Audrey in Unst, which I actually cast on for a year ago, and put away after 10 rows. 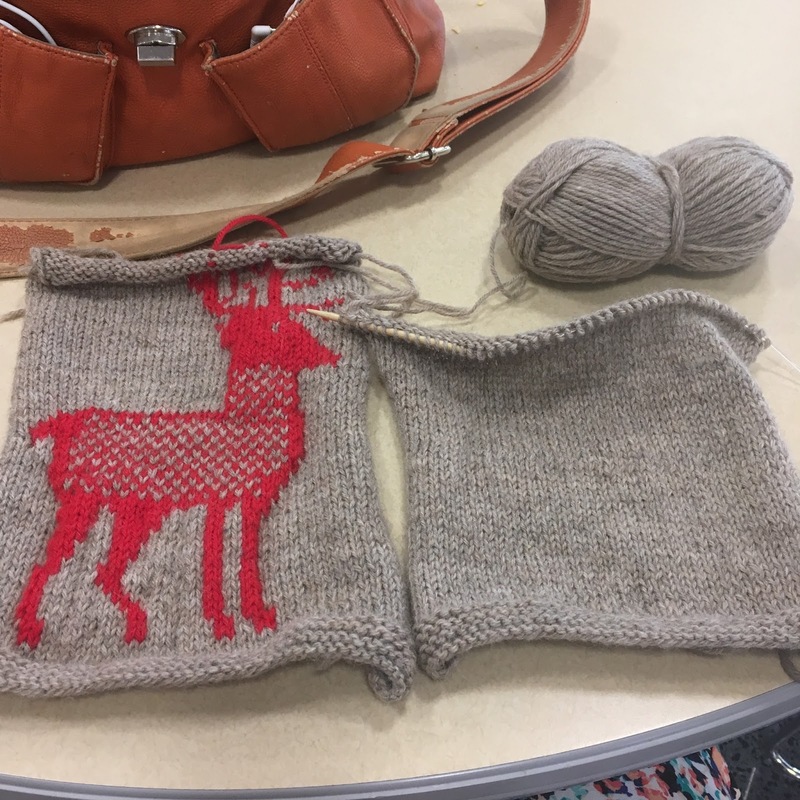 My plan going forward is to keep banging out my Filled With Secrets and my Xmas Sweater during my lunch breaks, and use evenings to power through my remaining xmas knits. 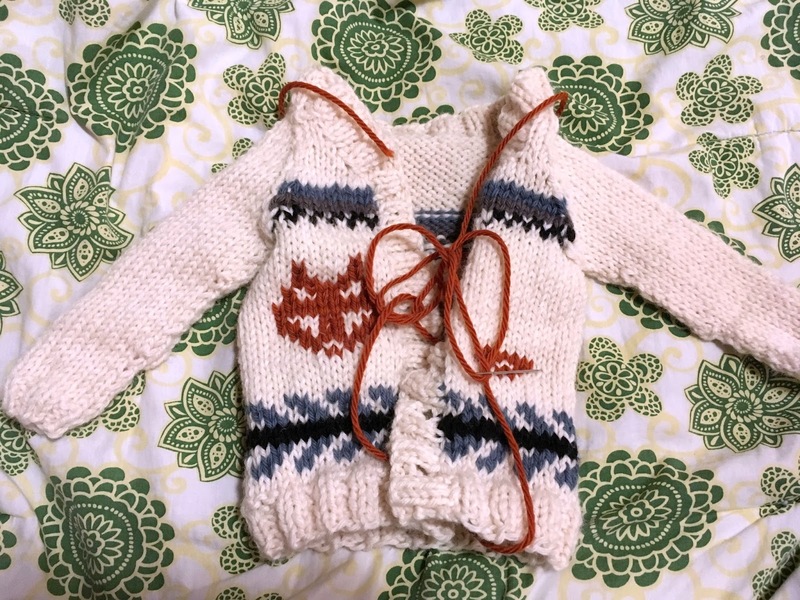 I've got the rest of this baby sweater, a toddler sweater, and another secret thing, and I think it'll all work out splendidly. When I ran out of yarn on my mum's sweater, I quickly came up with a very clever plan for the rest of the knitting season. I immediately cast on for both my Filled With Secrets and started going to town on the yoke. I fell in love with this pattern as soon as I saw the pictures of the sample. It's so cozy, roomy, and comfortable, and I couldn't wait to have one of my own to snuggle up in. 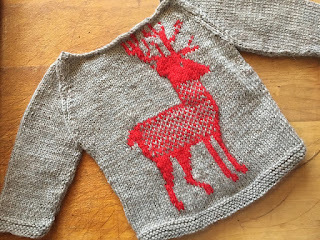 I decided to knit mine in Kenzie held double, and boy, is it worth it. 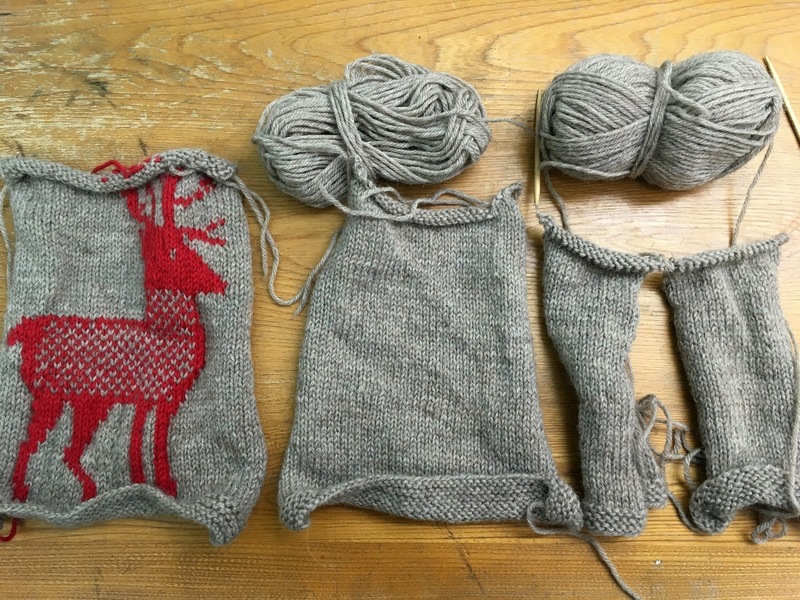 I've been rubbing the blocked swatches over my face for a week now-it puffs up and blooms so delightfully, and the fiber blend is such a treat. I'm hoping to get most of the yoke on this done today, and then over the long weekend I'm going to start banging out some xmas knitting. I've got just three xmas projects, and they should all be pretty quick (please don't remind me how fiddly and time-consuming duplicate stitch can be, I'm on a fiber high right now), and if I even just get one project done (come on, it's a four-day weekend, I can get more than one done) I'll be in a good place for the rest of the year. I woke up this morning to a couple inches of beautiful, wet snow, and a winter wind. We're supposed to end up with 4-6 inches by the end of the day, and I can tell you that all I really want to do right now is cuddle up and knit. 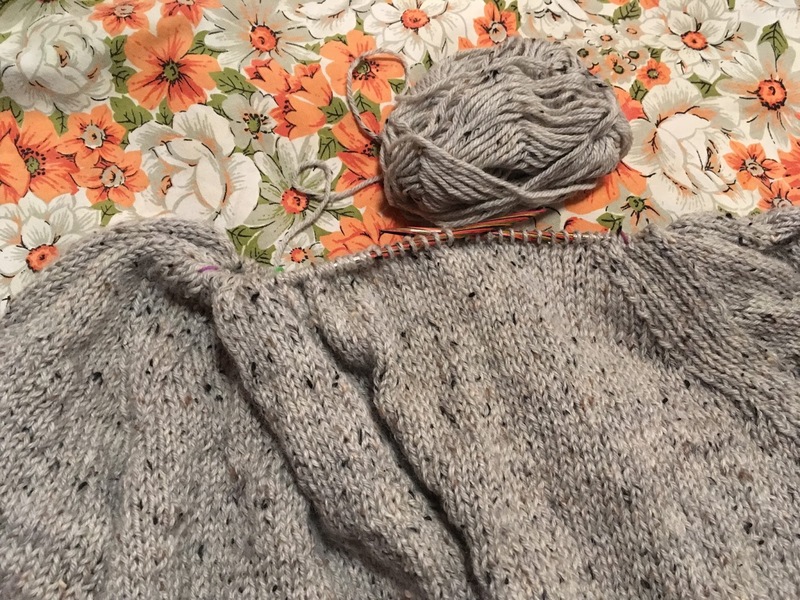 I started the pocket for my mum's sweater yesterday, and I've been making pretty good time on it. I'd like to get a bunch done during my lunch break today, because there's the big fall concert at the high school tonight, and I'd like to be back to plain knitting in the round for that. It's so hard to believe that xmas is just a little over a month away-I've got several sweaters planned for myself that I was hoping to get to work on, but I'm going to have to start gift knitting really soon. Fortunately, I don't have too much planned for this year, but I don't like having put everything off this late either! 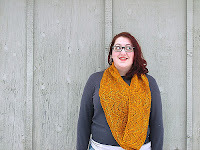 Oh my goodness, is that a picture of something OTHER than the blue shawl?? It is!! Shawlzilla came off the needles on Monday evening, and that is a tremendous weight off my shoulders. It still needs a blocking, and I need to find a couple of hours to do that, but the actual knitting is done and I'm pleased as punch. Now I'm back to work on my mum's sweater, and boy, does it feel good to be knitting with worsted weight again. 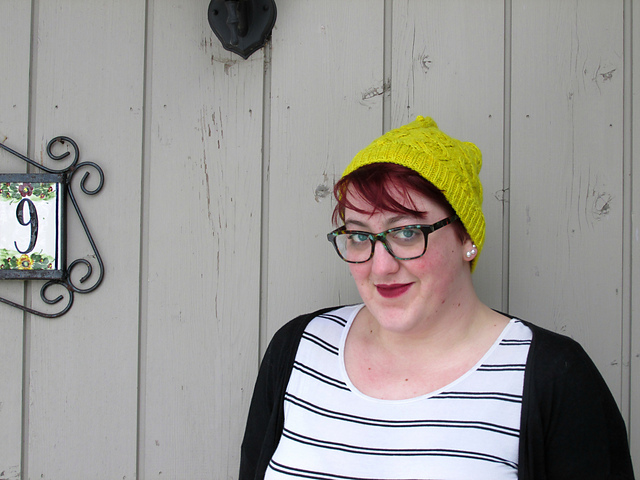 I also took a little break last week to whip up a quick hat-I'll have more details and modeled shots later, but I really just needed a cheerful yarn in a great pattern by one of my favorite knitters, and it really did the trick to help get me through last week. I've got two books on the go right now: I got Evergreen Falls from the library a couple of weeks ago, and it's been really enjoyable so far-I have a big stack of other library books out right now, so hopefully I'll be able to finish this one this weekend. On my Kindle app on my phone, I'm working through Black Swan, White Raven. This is the third one of this anthology series that I've read, and I love them all to pieces. Last weekend was the annual Scandinavian/Holiday Bazaar, and boy, did I clean house. I spent a liiiitle bit more than I planned to, but I don't regret a thing. I behaved myself really well in the rooms on the main floor of the church. I got some fantastic doilies, and that was pretty much it until we went upstairs. In the main housewares room I kept my eye out for some old silver picture frames, but I didn't have any luck. Then we exited that room and BOOM. Right in front of us was the yarn room. Honestly, the time I spent in the yarn room is a bit of a blur. But I got some great stuff. I got these four skeins of Lamb's Pride Bulky that are going to be this year's xmas sweater (yes, this year I am going to make an xmas sweater and actually have it done by xmas! I don't have a pattern for this one, I might just make it up as I go along), some Classic Wool that's going to become an Aiken, three skeins of Intermezzo Aran that will eventually become some kind of tee, and two skeins of Marley that are going to be a gorgeous chunky cowl (honestly, the colors in the Marley are the exact colors I'd love to dye my hair, so I was very excited about that). So, in total: two sweaters, a tee, and a giant cowl, and it all cost me just $35. After that, I wasn't really planning on finding much else, but then I found three vintage pattern booklets in the sewing and crafts room, from 1982, 1985, and 1993, and I am very excited about all of those, and I also got a new floral scarf and a necklace hanger. Overall it was a fantastic excursion, and I'm super glad we made it up this year. I had a normal, knitting-related post ready for today, but it's going to have to wait. Friends, my country did a profoundly stupid, hateful, and short-sighted thing yesterday. I'm in shock, I am sick, and I don't know how to process any of this. I am afraid for myself, for my own health and well-being, and I am afraid for my friends, and I am afraid for everyone else in this country whose lives and safety have been or will be affected by this. I don't have words right now. This is not the country that I believe in. I love you all. Hold each other. Take care of each other. Find beauty and goodness in small things. We need our communities and chosen families now more than ever. Find someone who's hurting and scared today and let them know that you love them, that you will stand by them and help them in this crazy world we all woke up in. I had a super busy weekend, full of great things! Saturday was the annual Scandinavian/Holiday Bazaar up at the Lutheran church in the city, and my mum and I went there and had a blast (more on that Wednesday, I think). Yesterday we went to see Doctor Strange, and that was a lot of fun. 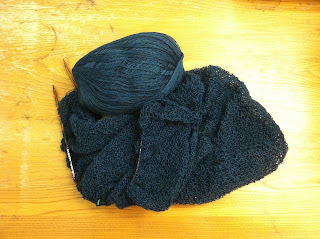 Last night around 11pm I finished the body of the blue shawl and started the edging-only 15k more stitches to go! 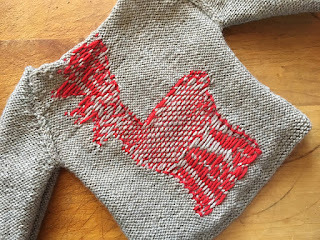 Yesterday was also the last day of the most recent CraftyBliss Instagram Challenge! If you're not already following Julie and Melissa (either on their blogs or on Instagram), you're really missing out. They're fantastic women and they know how to run an amazingly fun Instagram challenge. Since I know not all of you are on Instagram, I thought I'd share some of my most liked pictures from the challenge. Up first we have my Finn cardigan, for "my favorite FO," me on the couch in my skeleton socks working on shawlzilla for "a quiet moment," some new stash acquisitions from the bazaar for "flash your stash" (more on those on Wednesday), and the Sylvan Afghan I knit my mum a few years ago for xmas for "rainbows." There's only so many ways to photograph a shawl that's bunched up on the needles, I'm not sure if you can tell, but it is bigger than the last time you saw it-I've got 12,896 stitches out of 37,520 (34%) left to knit on the body, and then there's another 15,232 stitches for the border (yes, I'm a masochist, and I like to know how many stitches are left in giantzilla projects like this). All told, stitch-wise, I'm about 46% done, which is a nice place to be sitting, and I think I should be on the right track to get the body done this week. 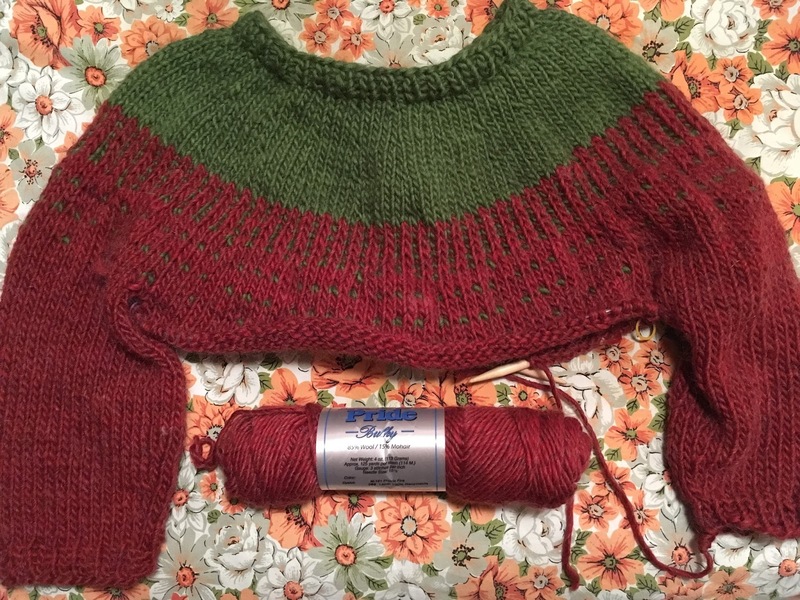 Fingers crossed and knock on wood, but I think shawlzilla is in a pretty good place, and the end is just in sight.